Google+ — Google’s unsuccessful attempt at creating yet another social network — is shutting down soon. 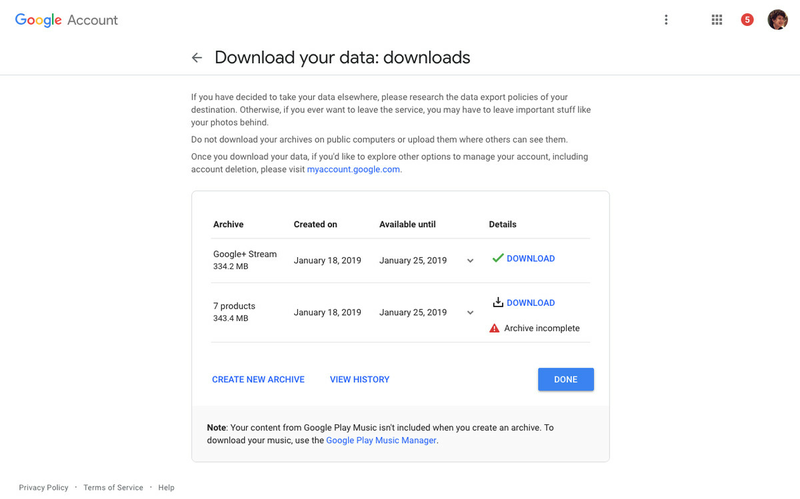 Originally slated to be shut down last August, the services will now be disappearing in April as a result, according to Google, of two separate data leaks. Whether you’re a faithful user or you abandoned ship months (or years) ago, you may still want to get a copy of your posts, photos, comments, and other content before the site completely disappears. It’s not a difficult task. There are applications that were built to make the process easier (such as the open-source app Google+ Exporter), and the official tool, Google Takeout, works fairly well (although it can occasionally be glitchy). Here’s what to do. 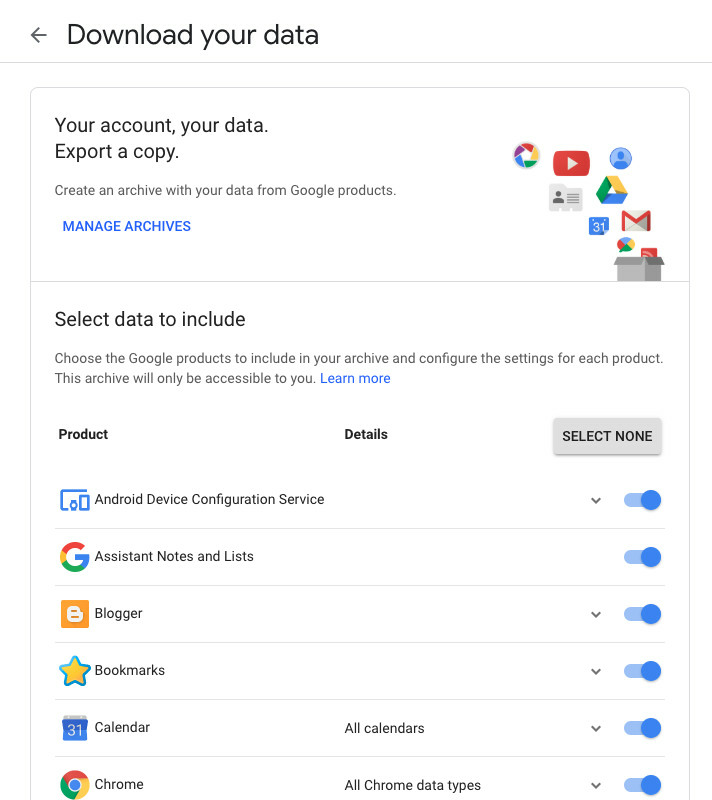 The long list of Google services that have data you can download might be a little overwhelming, but toggles to the right of each service let you select which sections you want to download. In fact, when you go to the page, they will all be toggled on. Unless you want to download everything that you’ve put into Google, your best strategy is to click on the button that reads Select None, which will toggle them all off. You can then toggle on just the ones you want to actually download. As you toggle each service on, pay attention to the little downward arrow that is to the left of some of the toggles. Those arrows indicate that you can select in which format you want your data to be downloaded. (It will vary depending on the type of data.) Click on the arrow to see what your choices are. It’s only available in HTML. You can download it in either JSON or HTML, or you can choose to download all of your communities or only selected ones. All of your Google+ posts. You can download the entire thing, or you can choose a specific type of data: ActivityLog, Collections, Events, Photos, or Posts. Available formats are JSON or HTML (except for the Photos, of course). It’s only available in JSON. Your messages. It’s only available in JSON format. If you’ve done any Hangouts Q&As, this is where they are. It’s only available in CSV format. Finally, select where you want your data to go. You can download the files to your computer — in which case, Google will email you a link when the data is ready — or you can have the info uploaded to one of several cloud storage services, including Google Drive, Dropbox, OneDrive, or Box. That’s it. Hit the “Create Archive” button at the bottom of the page, and you’ll get a screen notification that your archive is being prepared. I chose to download the info to my computer. Once I hit the button, it took about 10 minutes for the email to arrive letting me know my archive was ready. (Admittedly, I wasn’t that much of a Google+ contributor.) Unfortunately, there were apparently errors in the Google+ Stream archive. I tried downloading the stream again, and it worked. Then I tried again with all of the services checked, and it all downloaded in two separate zip files. If you’re still using Google+ and you’re looking for somewhere else to go, especially if you’ve created a community of people you want to keep in touch with, sites like ‘PlexodusWiki’ offer advice on how to do this and other social networks to consider. Meanwhile, the most important task on hand is to make sure that all of your conversations, photos, and other data that are currently sitting in your Google+ account are safe when the service goes dark.